The Event is completed, and post production begun. Some photo are posted at http://t.co/oAeuBYtfOy. Enjoy! 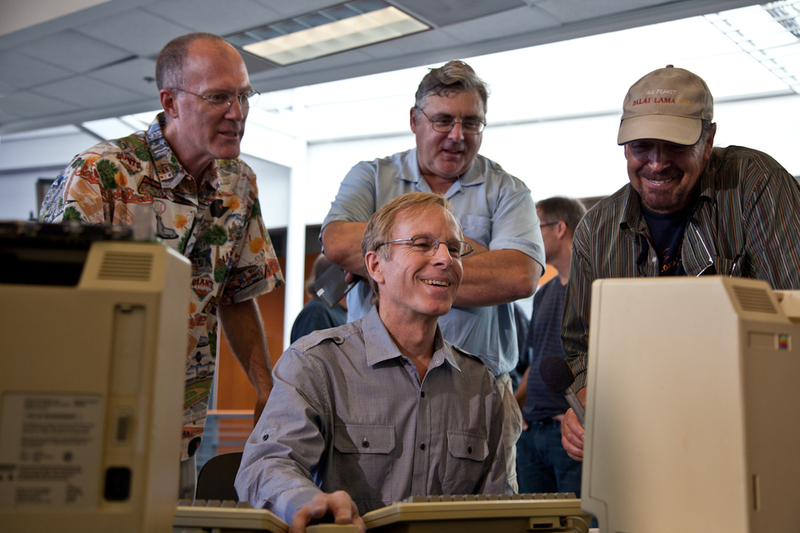 Many of the Macintosh team members gathered Wednesday, Sept. 11 2013 to play with one of the original "Twiggy Mac" prototypes still in running condition. As one journalist pointed out "It was more like a party than a Demo" -- but perhaps that was by design. After all, more important than the machines - is the people. The Mac really is that magical blend of both - man and machine. These are [some!] the Apple Macintosh Development Team folks that were given the challenge and succeeded, in changing the world. 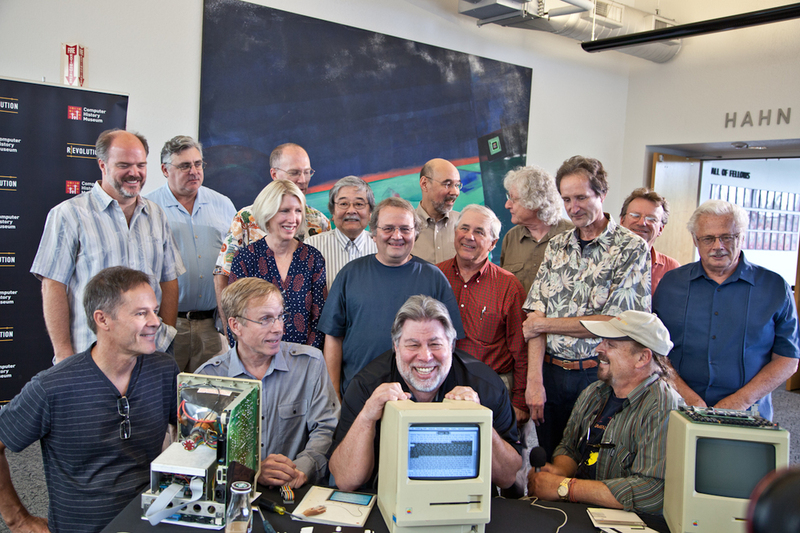 A group of old friends surrounding Woz and the 30+ year old Twiggy Mac Prototype. The Original MacWrite Team - Creator Randy Wigginton running the computer, with Ed Ruder (left) and Don Breuner (Center rear) looking on. Randy Wigginton during a terrific interview. Woz and wife Janet amused. Woz and Janet enjoying a few minutes with Andy Hertzfeld. Try to find someone not smiling in these photos... everyone enjoyed catching up, and playing with the prototype MacWrite and MacPaint on the prototype Mac. This group of photos courtesy of Jonathan Zufi -shrineofapple.com; The event was filmed as well, as part of the documentary produced and directed by Gabreal, and filmed by Bill Roden. Organizers of the event Daniel Kottke (L) and Gabreal Franklin (R) with DP of the documentary Bill Roden in on the camera in the background. At this point, most people know there are some very important "lacks of reality" in the film, especially relative to the early days, and Woz's vision and instincts vs what Jobs conceived. In any case, here is as good a place as any to look at reviews, and in many cases get clarifications from those folks who were involved in those "Early Days". Please post questions here, and we will look to solicit realistic and verified clarifications. Here is something from: http://filmdrunk.uproxx.com with comments from Woz AFTER he saw the whole film. Wozniak On Jobs: "A lot of what was wrong came from Ashton's own image of Jobs." I felt bad for many people I know well who were portrayed wrongly in their interactions with Jobs and the company. The movie ends pretty much where the great Jobs finally found product success (the iPod) and changed so many of our lives. I’m grateful to Steve for his excellence in the i-era, and his contribution to my own life of enjoying great products, but this movie portrays him having had those skills in earlier times. Ashton’s performance was remarkable. Woz will soon realize as an actor, Ashton was working off a ‘Bible’- a script that when facts were involved, defined those facts. No wonder Ashton has the ‘wrong idea’ about how things really were. Yes, absolutely and inarguably Jobs did not have the sole vision that created the early Apple products. Far from it. Truth be told, some wonderful breakthroughs happened in spite of him, not due to his technical ‘vision’. But he was the 'father' of the Mac - as Hertzfeld says, and that says a lot. Of course Woz is completely spot on about that aspect of the film – he is Woz. He was there. He WAS responsible for a lot of the innovation. But blame about the horrible factual errors is at the script level, and not taking advantage of resources like Daniel Kottke, David Traub and others- who they DID have a channel of communication with, but chose not to, did not run changes by, or care to listen. I am defending Ashton’s image of Jobs – he did get some of those [many[ sides extremely - almost spooky - spot on. It is the factual flaws that are the only things preventing this from being a great film. He truly captured parts of Jobs, and some of his complexity. I have come to look at it this way: Those flaws (in the film) are Steven P.'s POV - Point of View. I'm sure it is how Jobs would have liked to remember how things went. Although very likely Mr. Jobs himself would not have tried to claim - the credit falsely applied to himself. It's been long enough now to say, many folks who knew Steven P. over the many years feel that Apple has every possibility to actually do better in the future without Jobs. His persona at Pixar, and that whole lifeline, seems to almost be another [wildly successful] person. The JOBs film is worth seeing because it is certainly in insight into Mr. Jobs, as wrong wrong as the early years were factually. His contributions after his return - remarkable. It is just a shame the early years were so off base. Yeah on the film, Boo on facts off the planet. How can any film, really, capture any person - especially someone as complex as Steven Paul Jobs?